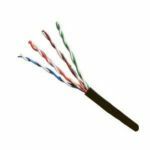 This CAT 5 cable is used for permanent installations for runs which are external to a building. Please enter the desired length (in meters) in the quantity box. Cable will be supplied in one continuous length to the number of meters you order. Max. length 500M.